Dadje Samuel (pictured at right) has a passion to reach people for Jesus. A long-time businessman and contractor, the 45-year-old father of 10 has turned his focus to helping new Grace Brethren churches become established in his native Republic of Chad and other nearby central African nations. “When we have love for the lost, we are true friends in Jesus,” he says. 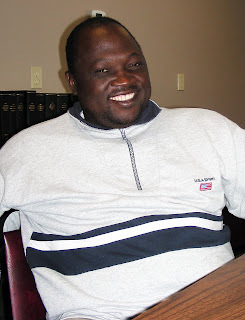 In 1998, Samuel was part of a contingent of African men who traveled to the Chateau, the Grace Brethren conference center in St. Albain, France, for evangelism training. The sole layman in a group of pastors, he was included in the sessions, even though he had traveled with the group to meet with an American businessman who was interested in starting a business in Chad. Upon his return home, he established a training center that would become the impetus for church planting in the region.